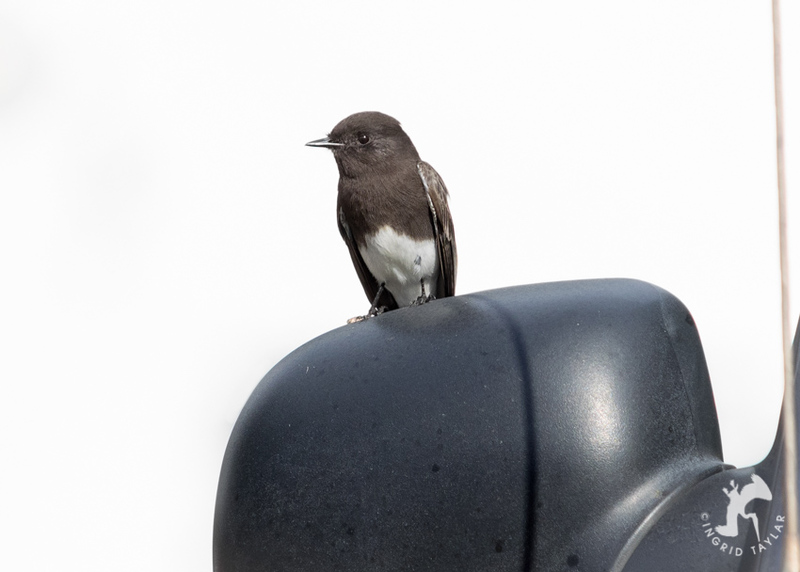 On my walk over, through Redondo Beach, I saw two Black Phoebes (Sayornis nigricans), one who preferred automobile side mirrors as perches. She’d flutter down for an insect grab, then return to her station. 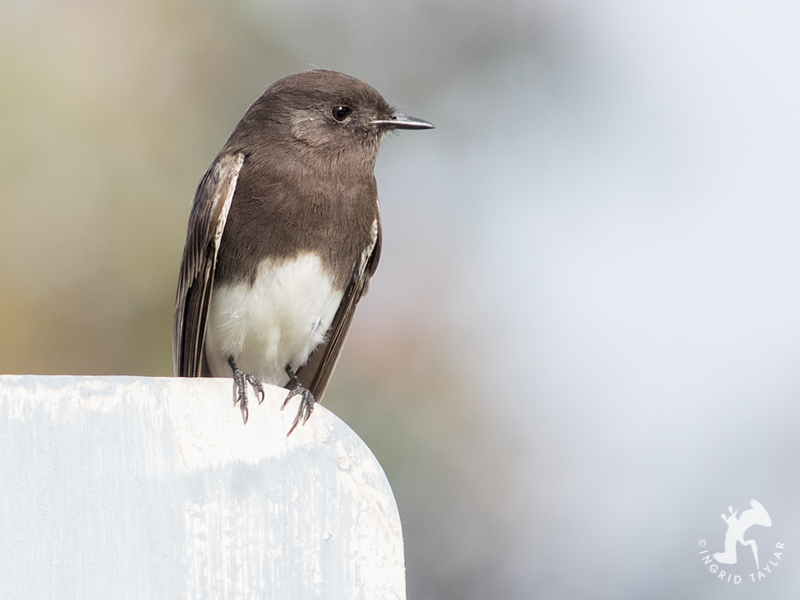 My plan was to slowly sidle up to the bird and see how close I could get. If I had an opportunity, I’d throw my jacket over him and quickly grab him in a body lock. (I could use a hands-free GoPro in these situations, to illustrate the scenario.) As soon as I got within jacket-tossing distance though, he got up and moved just out of reach, eyeing me constantly, obviously not wanting me close. I couldn’t see the nature of his injury yet and didn’t want to stress him, so I backed off to observe from a distance. After a few minutes, the gull decided to join his flock, skimming the sand in a compromised flight pattern. It seemed like a mere instant that I looked away, but when I turned back I caught a near calamity out of the corner of my eye. A white shape was bobbing in the surf and I knew instantly it was him. He must have been taken out by a particularly big wave because he’d been safe and dry on the berm. He was so debilitated, he was bobbing in the water like a marionette. I had no time to stash my camera, I just slung it on my back like a messenger bag and ran over to the location. I could see him being swept out and I was frantic about how I would reach him. It looked hopeless. 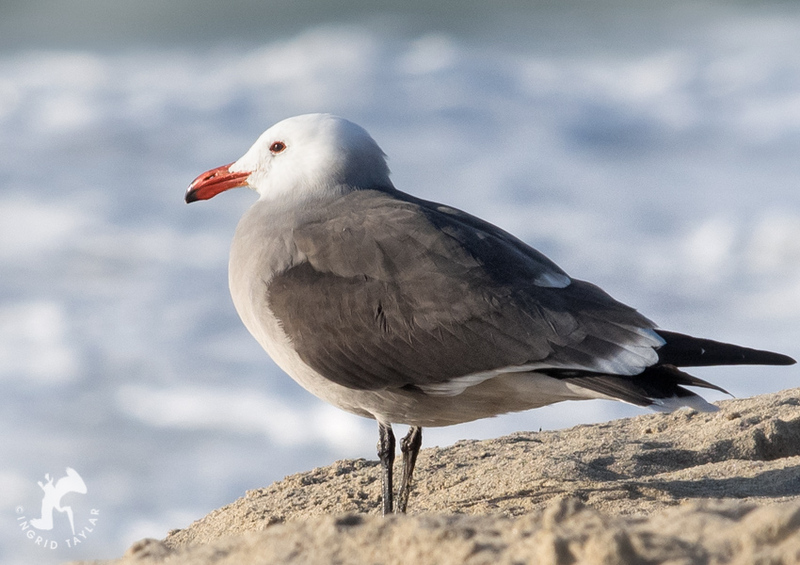 I had just a split second to figure it out when, in a move I couldn’t believe — one serendipitous gesture by nature — a huge wave pushed the gull back toward the beach. He was flattened against the sand and struggling as the undertow pulled him back out. But, it was just enough time for me to dive into the water and grab him around the wings and tuck them against his side to constrain his moves. As I did so, my camera swung around my back and it was just a instinctive block by my elbow that kept it from becoming a lethal device. 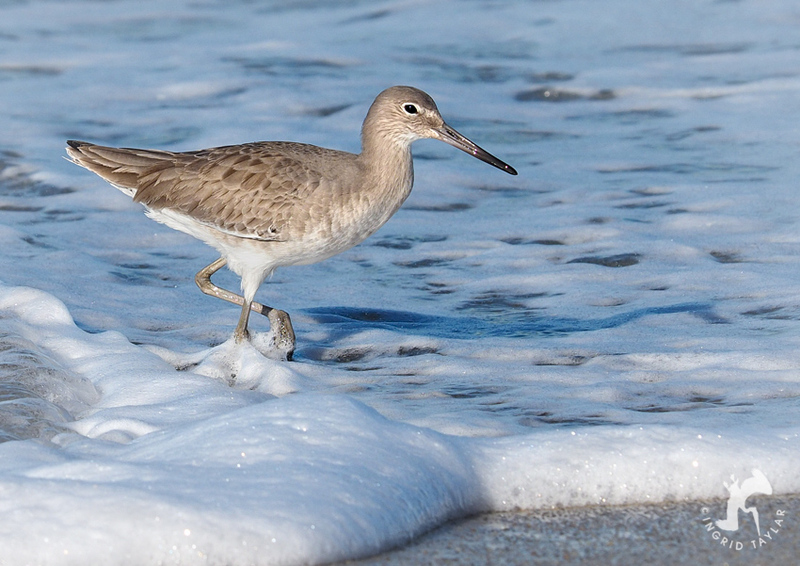 I emerged from the surf like the creature from the bog, me and the discombobulated gull, soaked, salty and sandy. I wandered over to the boardwalk and seaside steps and rested for a minute, pondering my next move. I didn’t know where the nearest wildlife rescue was, something I usually suss out ahead of time on trips. I was just utterly unprepared. Except for the scissors. Which I couldn’t reach in my camera bag without losing a grip on the gull. This gull must have had a diligent guardian angel because just as we sat down together, shaking off the salt water, a woman — a runner — came up, saw the situation, and asked if anyone had scissors. I told her I did. She grabbed them out of my bag and I asked if she’d ever cut monofilament off a bird before. She had. She was a veterinarian. 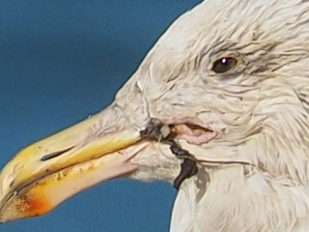 She snapped the fishing line off the gull’s bill first, and discovered that same line was also wrapped around his neck. At this point he regurgitated on me which I hoped was a sign that he had, in fact, been able to digest food in his sad state. Wet, salty, muddy, with fishy regurgitation — I figured my new camera was probably a muddy sight, but was glad I didn’t have hands free to assess the damage. 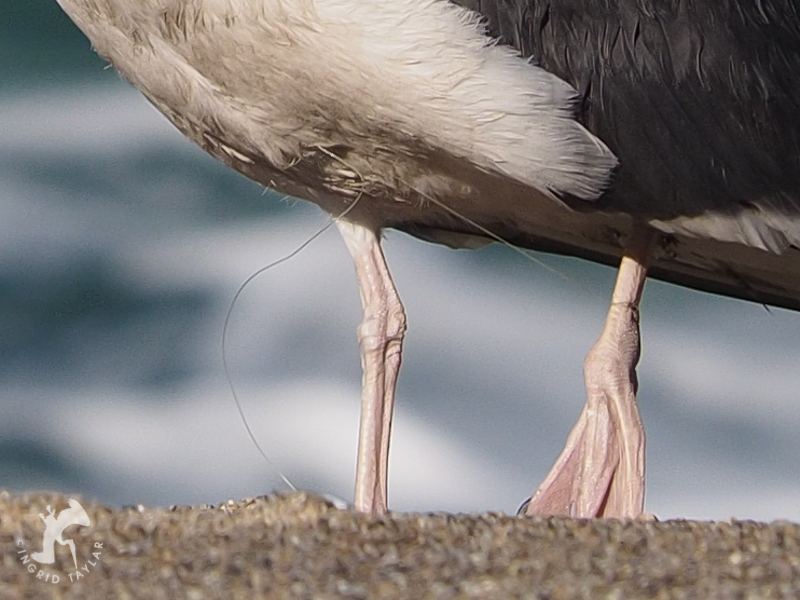 The vet next clipped the line around the gull’s legs, discovering the worst part: a hook deeply embedded in his foot. From this hook the line twisted around his legs and then like a tourniquet around his wing joint. The wing was not broken or visibly damaged, thankfully. But in examining it, she found another hook embedded underneath the wing in his side. We both speculated that the hooks were barbed and that removal would be impossible here on the beach. She decided to try, gently, removing the hook in the foot. It wouldn’t budge so the next step was getting him to a wildlife rehab where the hooks could be removed with anesthetic. In another stroke of good fortune, I remembered that International Bird Rescue had a hospital in San Pedro, about a half hour from where I was. They handle seabirds and gulls. 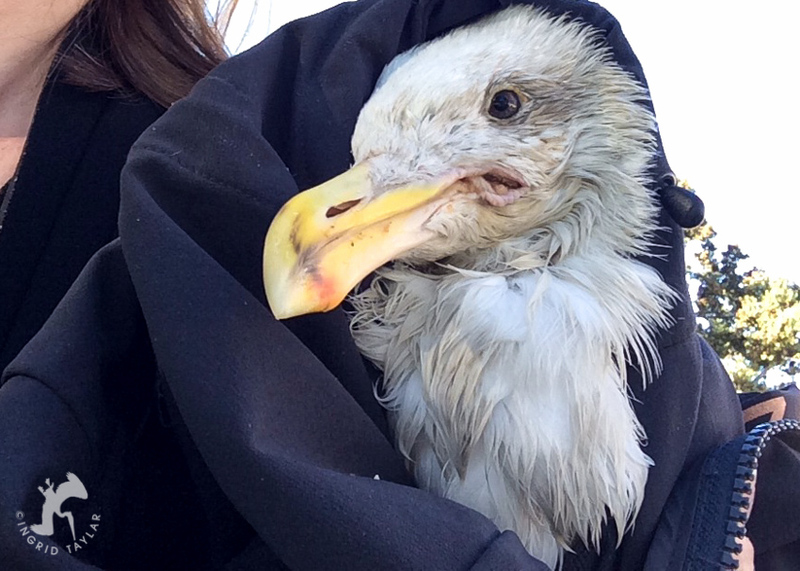 So, after getting the gull into a carrier (I keep a portable one in my car), this Western Gull was finally on the road, literally, to healing. I was never so glad to be in the good hands of professional rehabilitators. My wildlife skills have a serious limit, I was a part-time volunteer. So, like everyone else, I rely on the medical expertise of places like International Bird Rescue when situations like this arise. If my dream world were to manifest, every wildlife license, hunting tag and fishing permit would allocate a portion of the revenue to establishing and maintaining wildlife rescue facilities in every city in the country. So often, wild animals go without this type of aid because there is nowhere to take them. And in a case like this, the damage and injury is a direct result of a sport that causes an immense amount of ancillary damage. 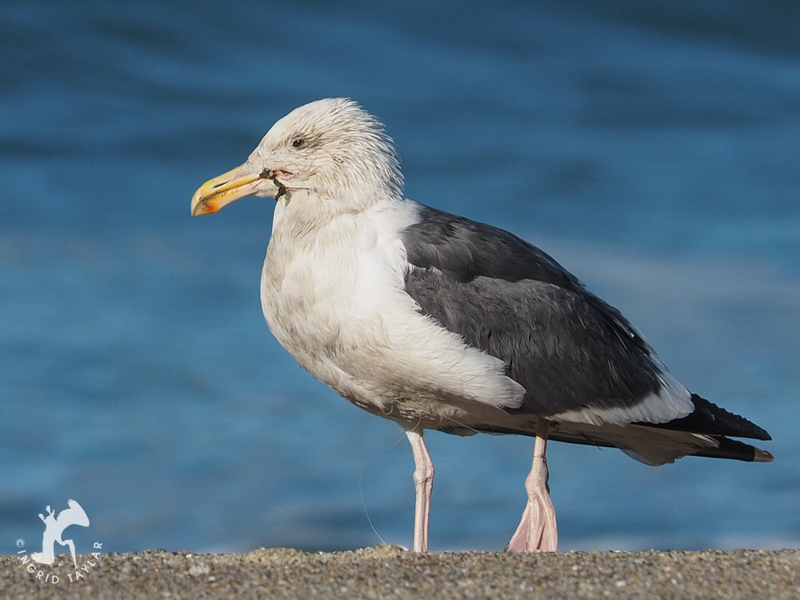 Fishing line is a seriously common problem with seabirds and marine mammals … and also for raptors who catch those fish, or other animals who become accidentally entangled in the monofilament that litters our waterways and adjacent lands. POSTSCRIPT: Olympus E-M1 camera stood the test of beach and was fine. Face injury was totally minor.